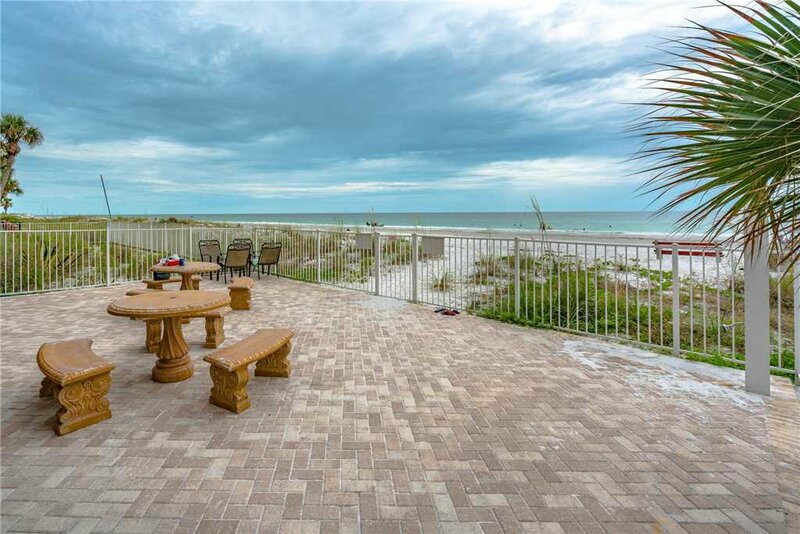 The murmuring surf, the blazing sunset, and the invigorating sea breezes both soothe and stimulate you as you gaze out at the ocean. 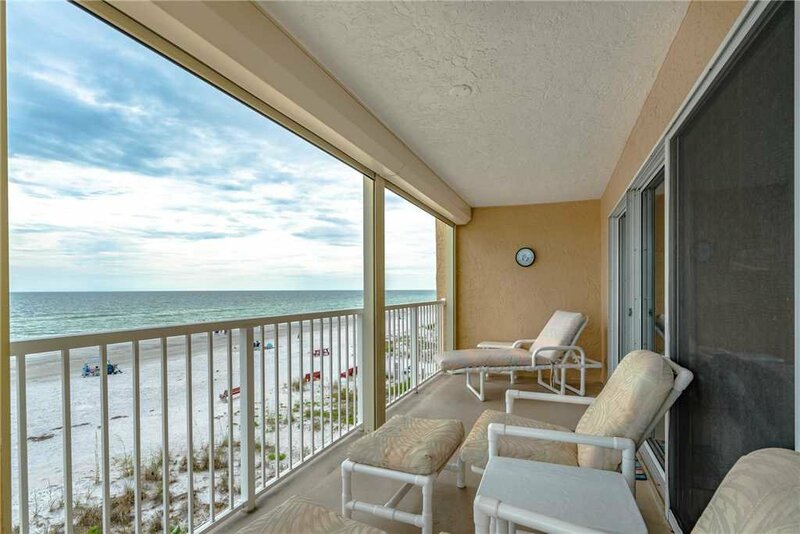 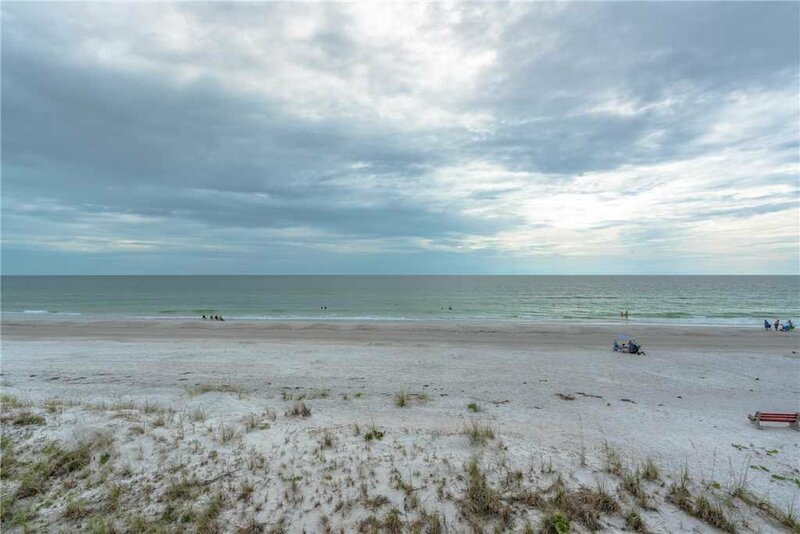 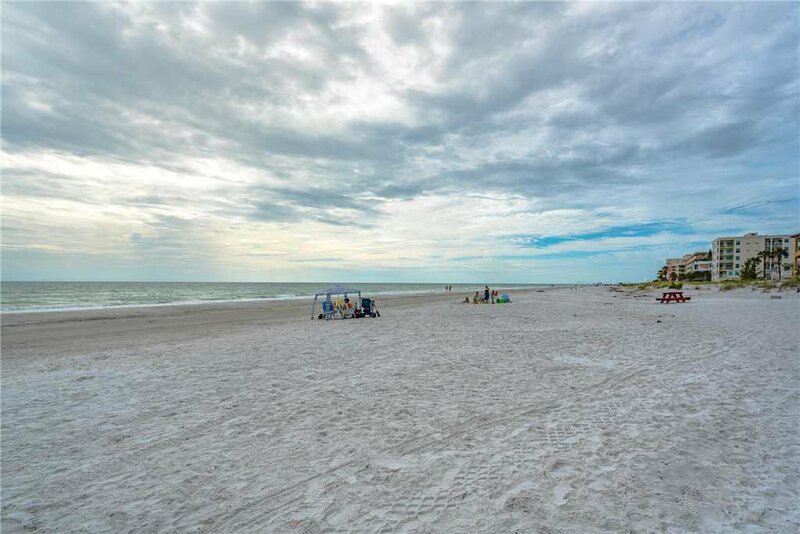 Come stay at Pointe Condo #201, and enjoy rock-star beach views! 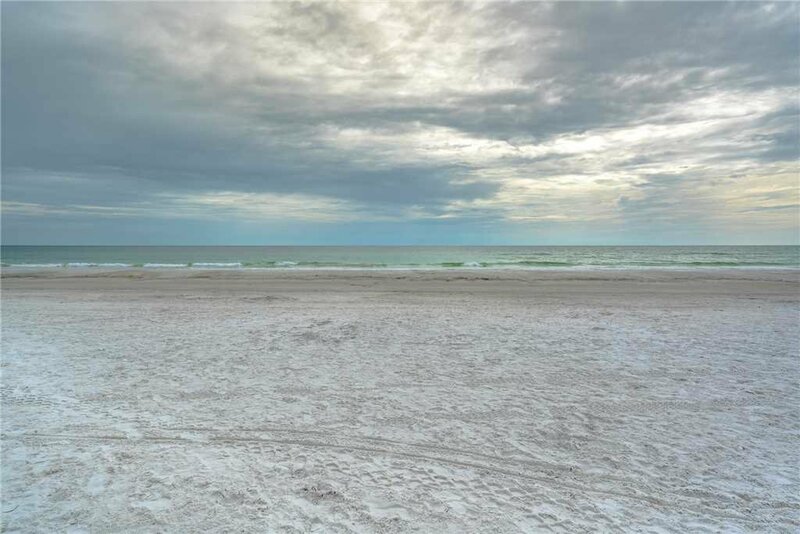 Unless you were actually floating in the waves, you couldn't be closer to the beautiful gulf coast of Indian Shores. 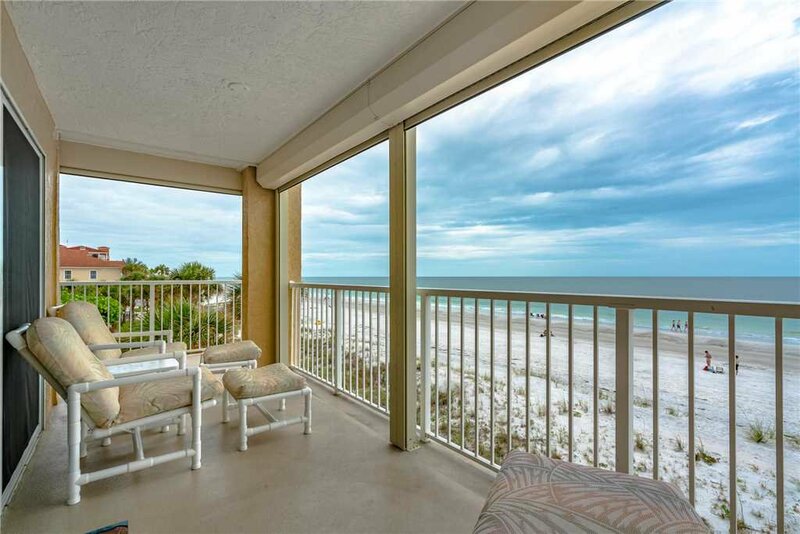 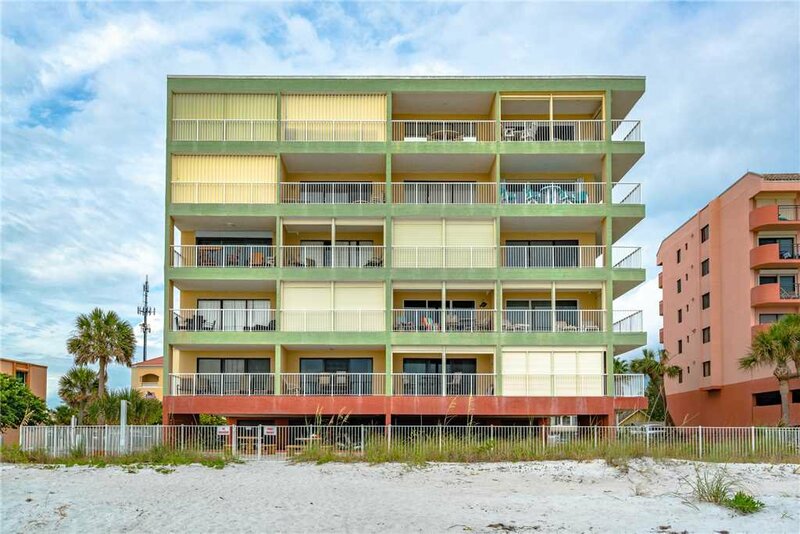 Pointe Condo #201 projects out toward the beach, with nothing beside you but palm trees and nothing in front but sand and sea! 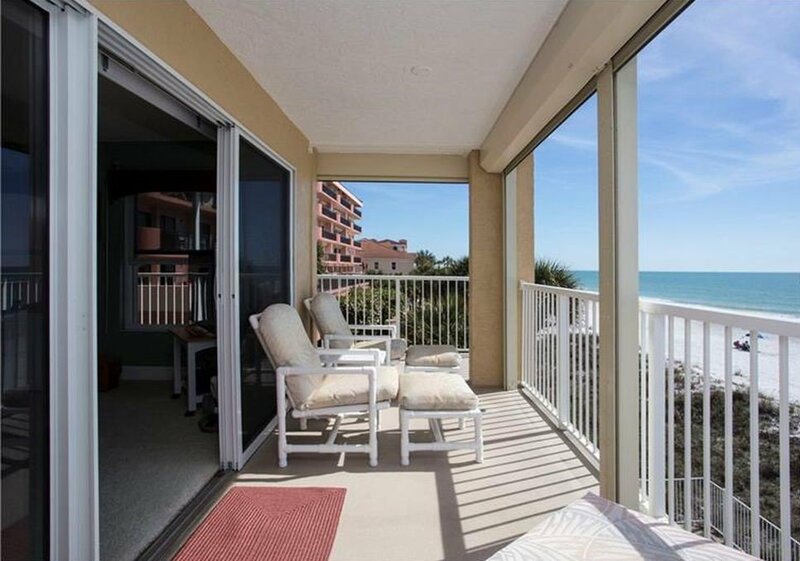 Along, breezy covered balcony makes room for the whole family to stretch out and enjoy the caress of that warm Florida air! 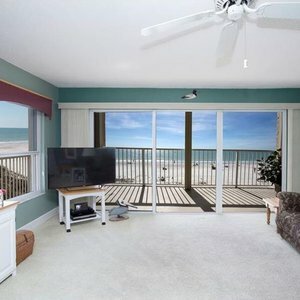 When it's time to go indoors, you may wonder why you waited so long: the big living room is just an extension of the view you had on the balcony, with sweeping vistas from long windows and sliders on two sides of the room. 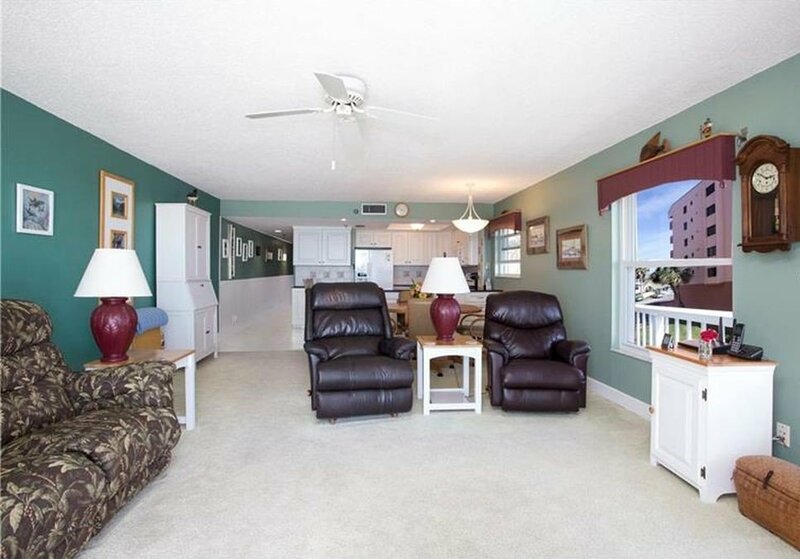 After you have watched the sun sink below the horizon, turn on the big HDTV and collapse into one of the ultra-comfortable overstuffed chairs. 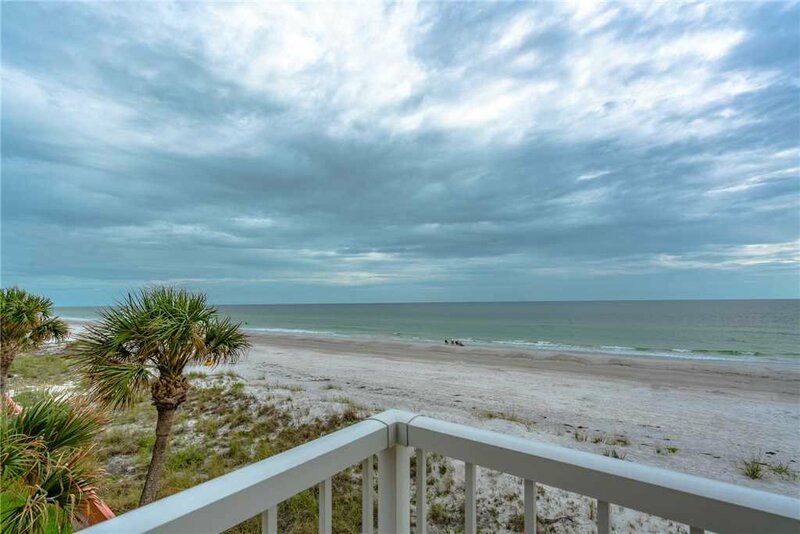 The evening is yours, your family and friends are around you, and life has never been better! 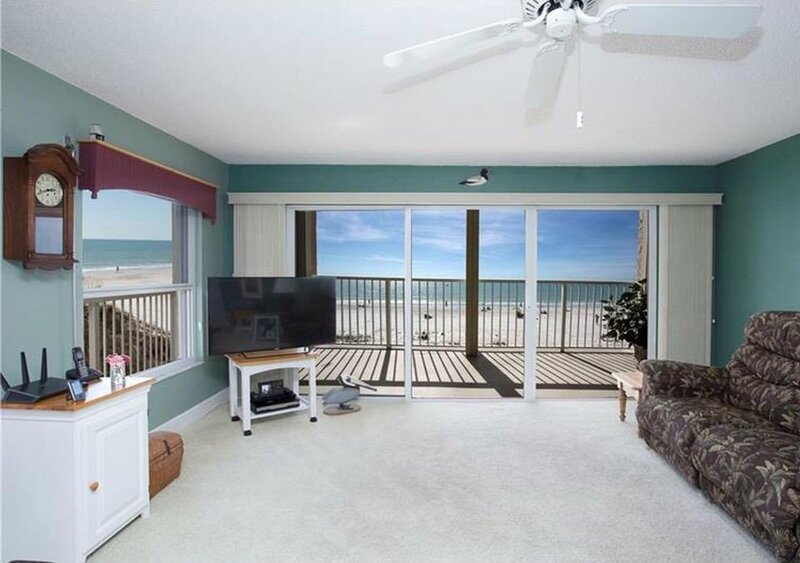 The common area at Pointe Condo #201 is large, spacious, and pleasant, with walls that evoke the colors of the sea and plenty of open space for the kids to spread out their toys and projects. 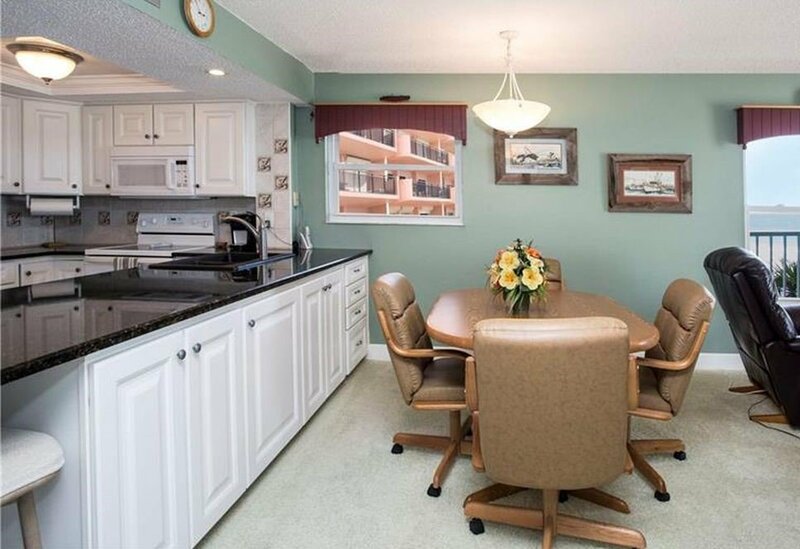 No cramped hotel room quarters here -- this is a family home, with a big dining room table just beyond the living area that doubles as a game center and triples as a laptop and tablet workstation. 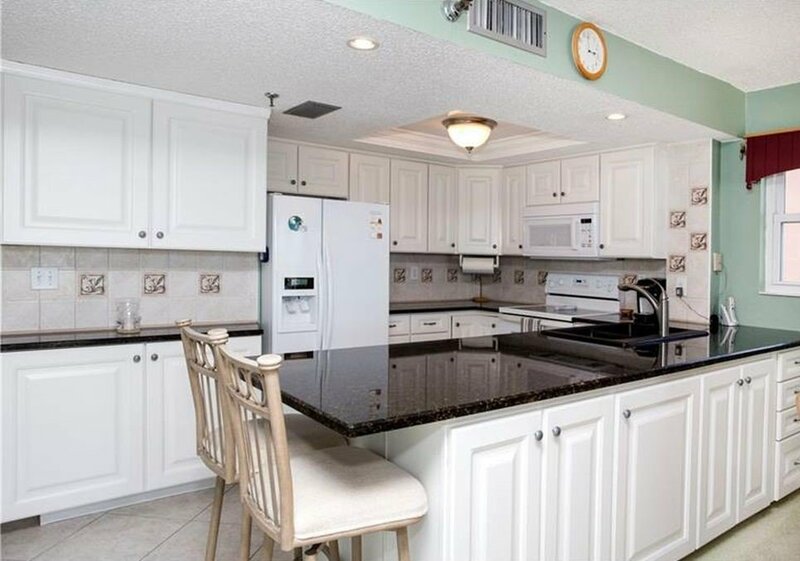 Your group can divide up in here without leaving the common area, with some folks watching a show on TV, others playing a quick game (or 10) of gin rummy, and still, others whipping up frothy drinks in the kitchen. 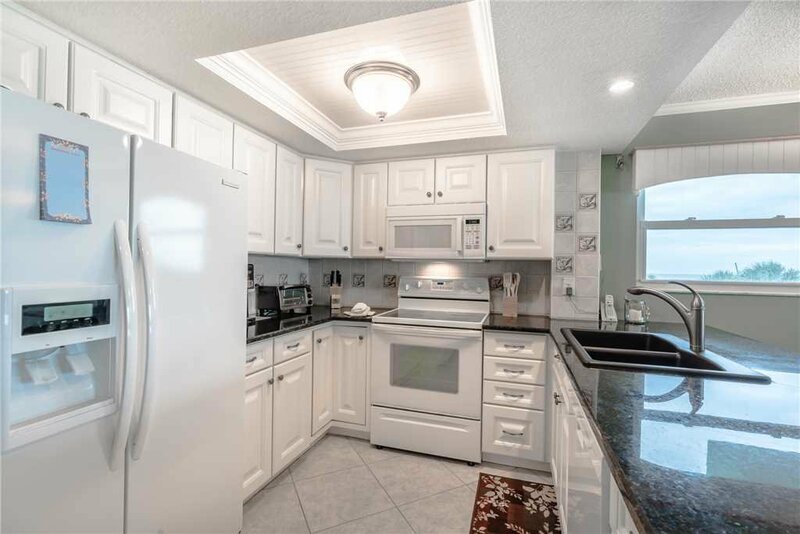 About that kitchen -- it begins with the breakfast bar at the granite-topped island and continues throughout a galley-shaped space just packed with cookware, dishes, utensils, and all those nifty countertop appliances that make our lives so much easier. 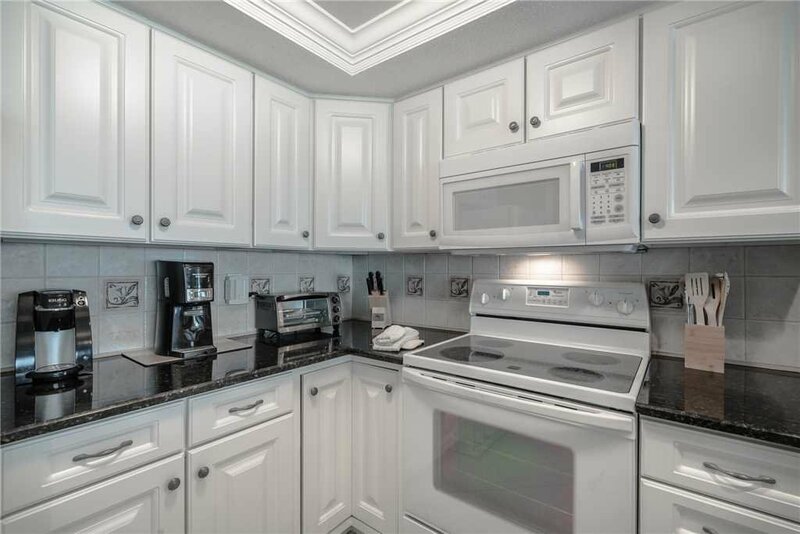 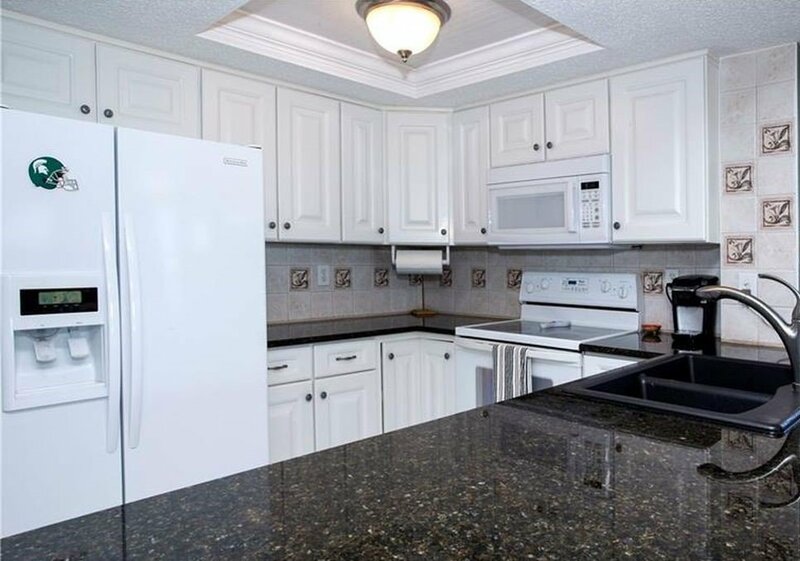 Of course, Pointe Condo #201 has full-size appliances as well: the big fridge, with ice and water in the door, is just waiting for groceries, and the spotless oven is ready for the chef in your group to get creative. 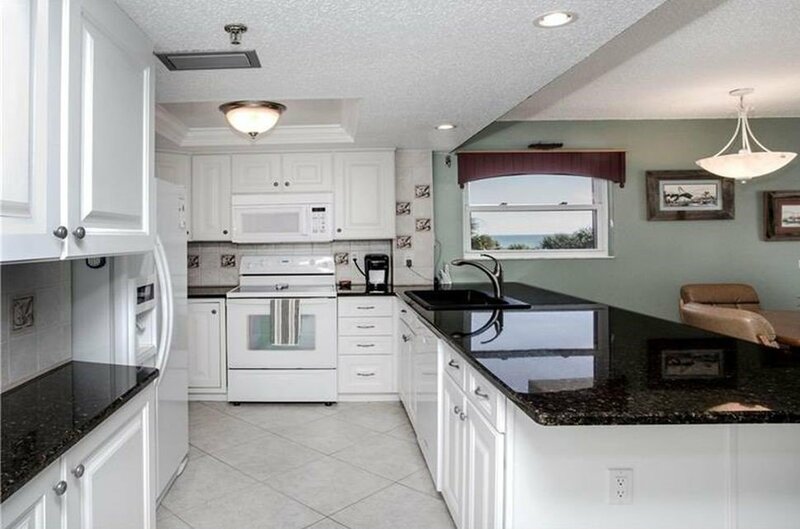 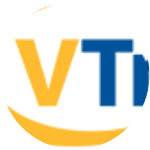 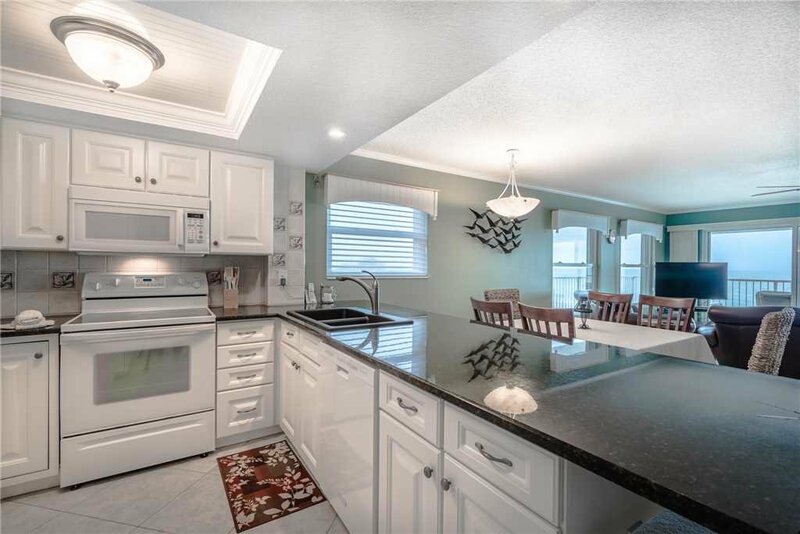 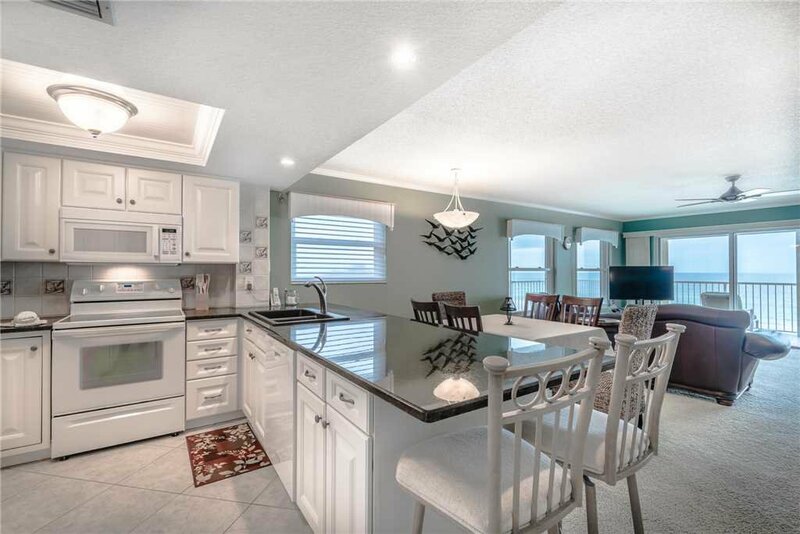 So whether you came to Indian Shores with the idea of eating out every night, preparing delicious homemade feasts, or some mixture of the two, this kitchen's got you covered! 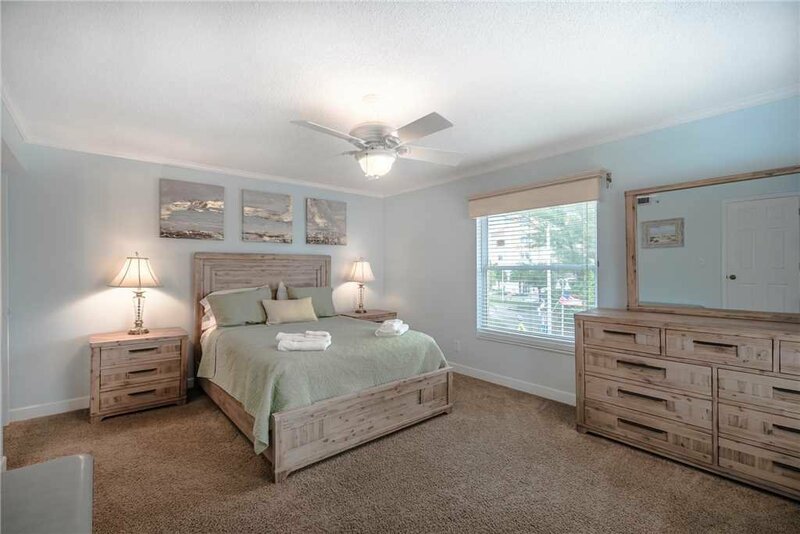 As much as you love the openness and light of the common areas of Pointe Condo #201, you'll appreciate the privacy and calm of the two bedrooms. 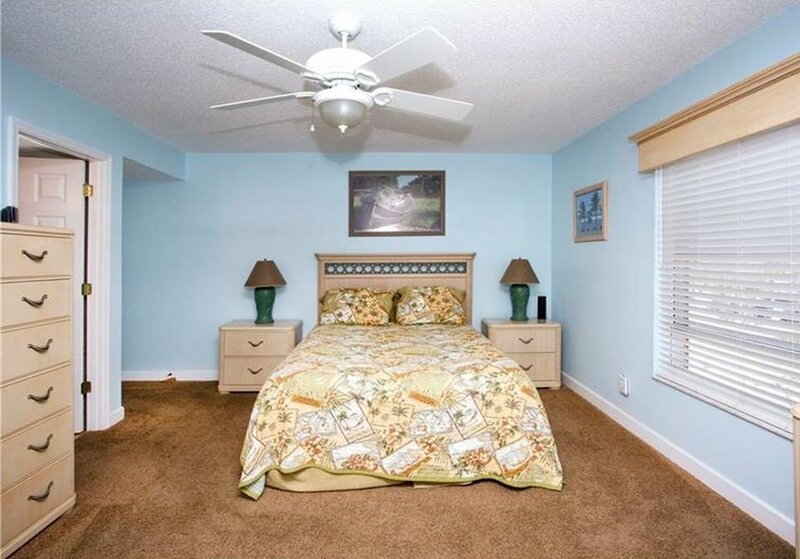 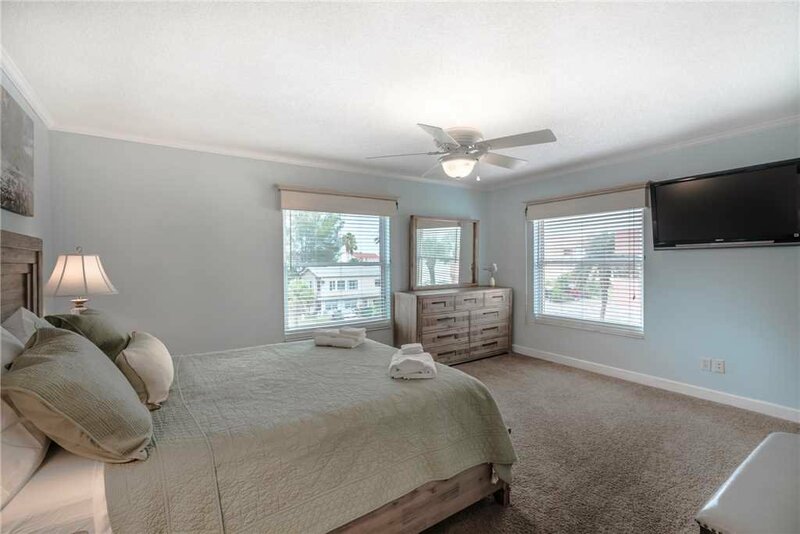 The master suite is particularly soothing, with its luxe queen-sized bed, huge HDTV, and plenty of open space. 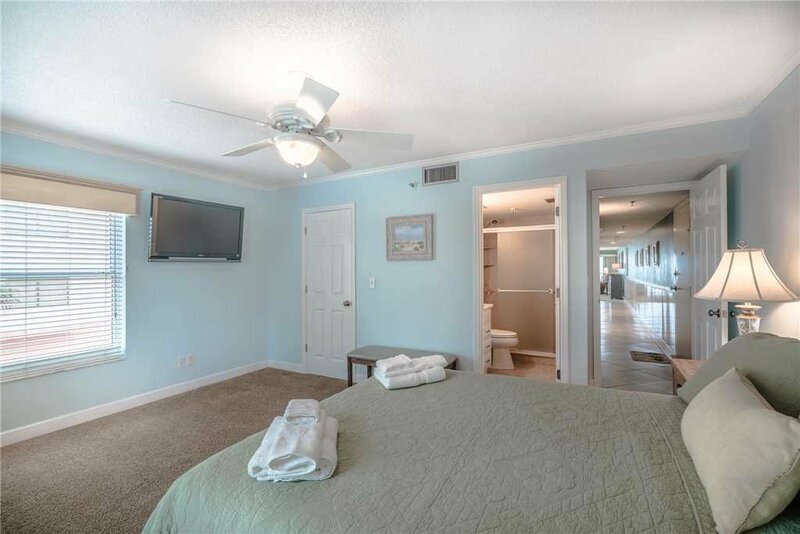 You can breathe in here, and enjoy the moments of relaxation after all your adventures on land and sea at Indian Shores! 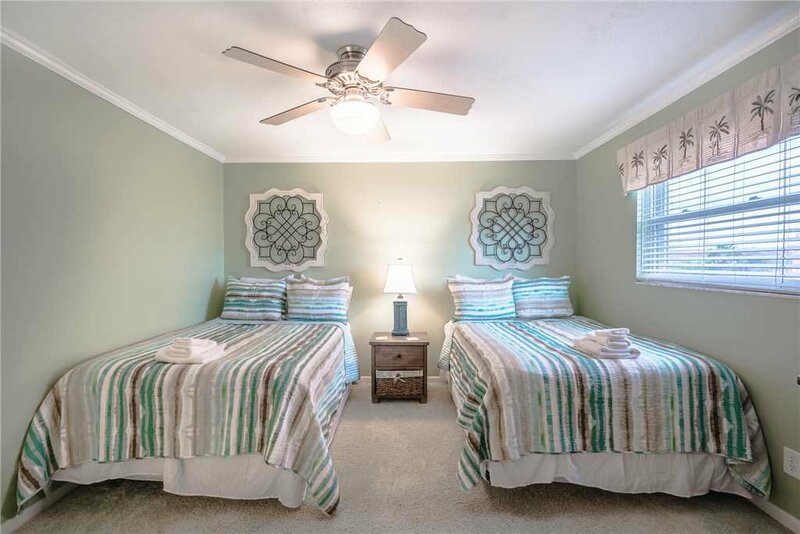 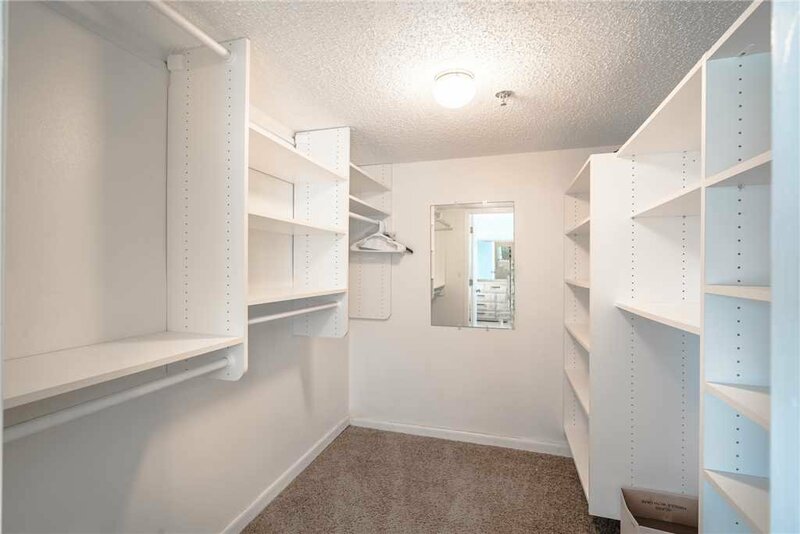 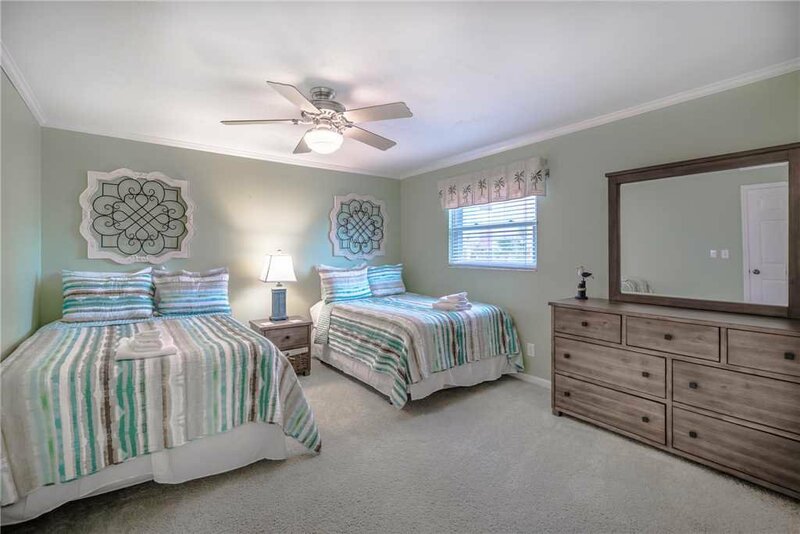 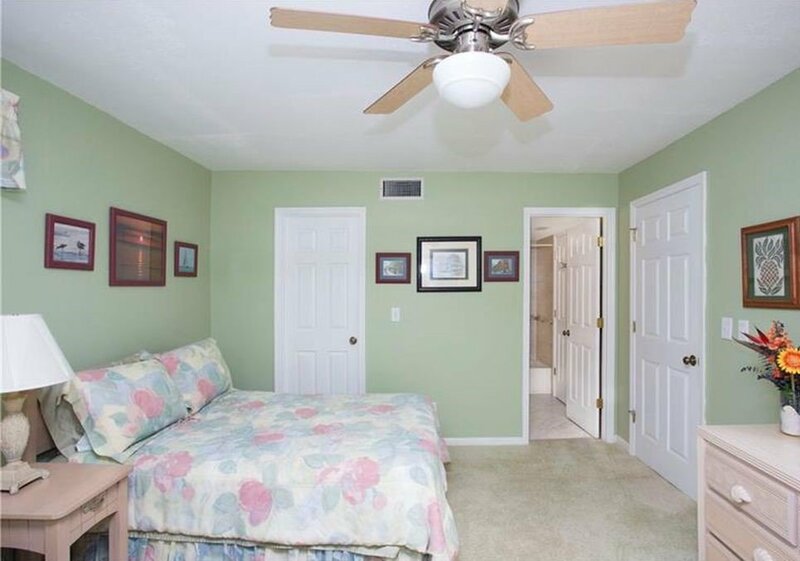 The powder-blue walls and white trim are cooling after a long day in the sunshine, and the big empty closet lets you stash all your clothes and vacation toys out of sight. 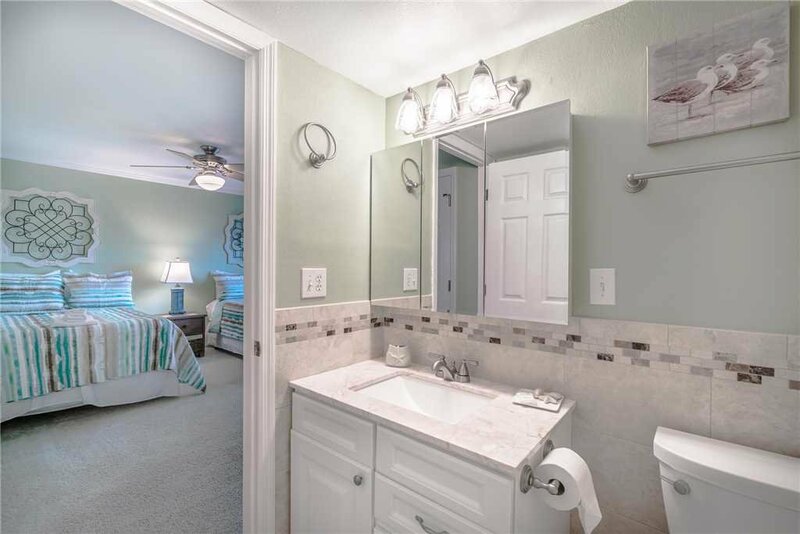 The master suite includes a full bath, so you need never get dressed before grabbing a quick shower, or getting ready in the morning. 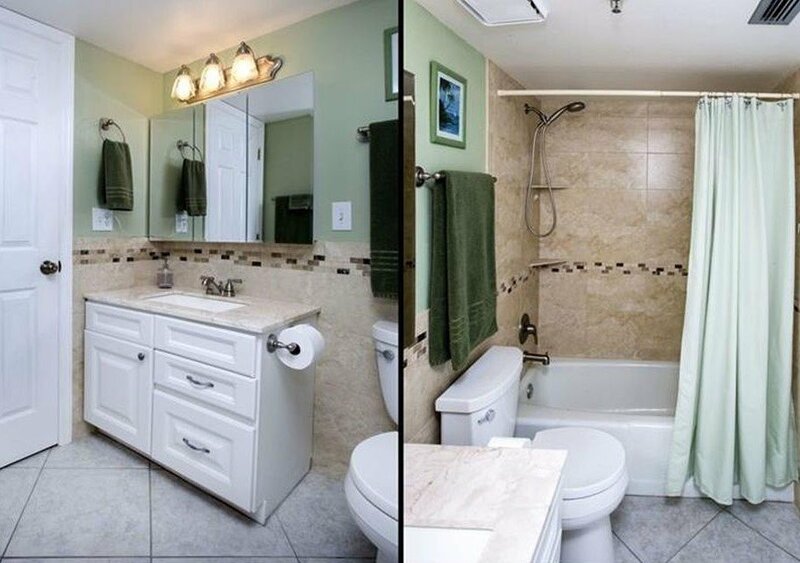 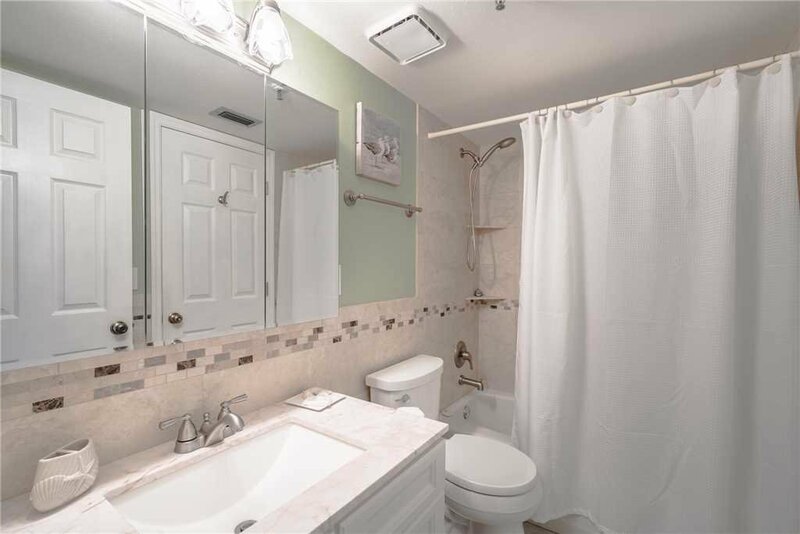 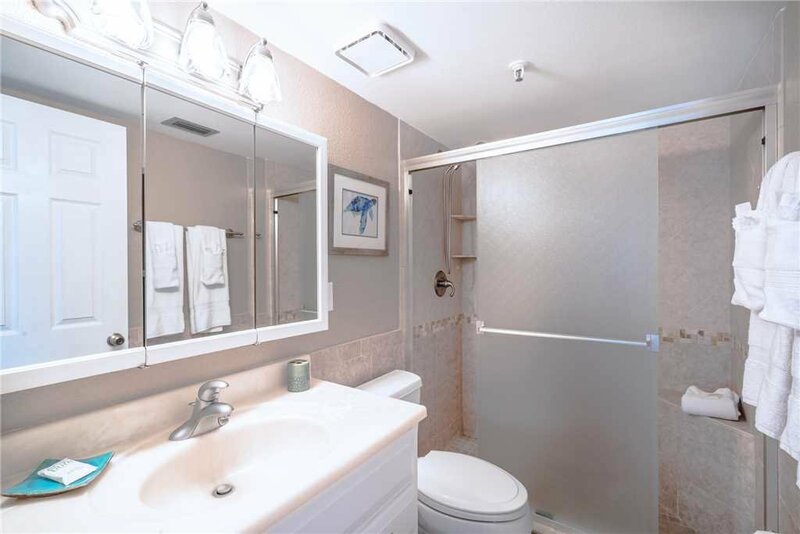 And of course, all the towels and linens you need for every bed and bath are provided here at Pointe Condo #201, along with extras. 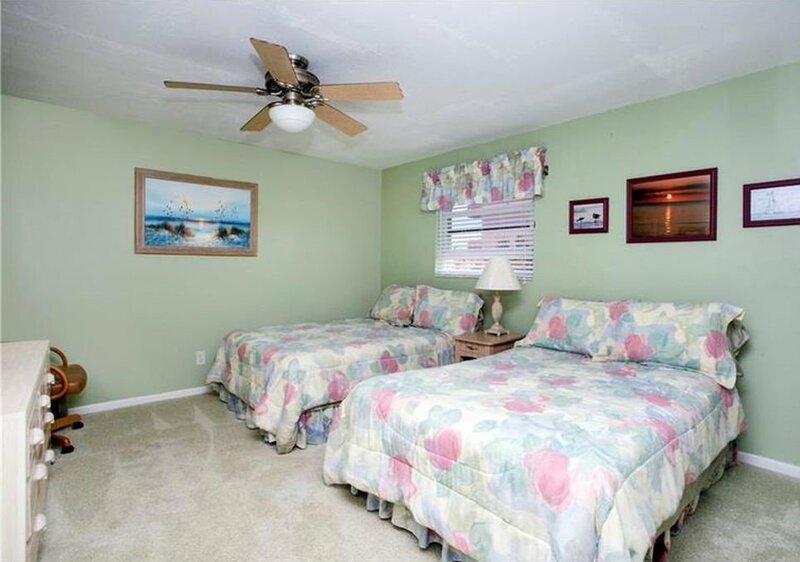 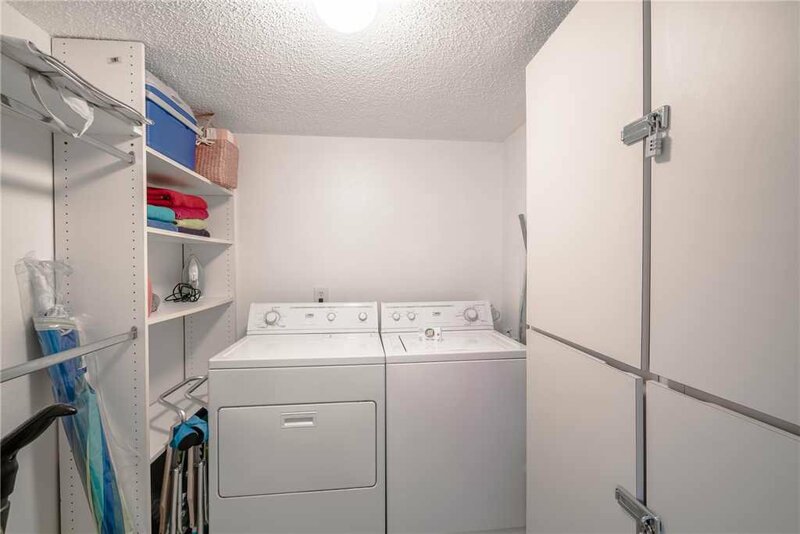 We've even got a laundry room with a washer, dryer, and hanging racks for your use, so everything stays fresh and clean no matter how many times the kids want to run down to the beach "just one last time" before bed!